One gets invited into the life of Raees (Shah Rukh Khan) who resides in Fatehpur, Gujarat who at a very early stage in life is inspired by his mother, a ragpicker who quotes, “Koi dhanda chota ya bada nahin hota hai, aur koi dharam dhanda se badkar nahin hai.” which literally means, no occupation is small and no religion is bigger than one’s business. Fair enough! So with this as his mantra and philosophy he sets out to take the world on his own terms. He starts off small by working for Jairaj Seth (Atul Kulkarni) who indulges in branded liquor. Jairaj appoints “Raees” because he has, “baniya ka dimaag aur miyabhai ka daring,” How Raees gradually grows from a young lad into a formidable figure in society, forms the crux of the tale. That being the case, he decides to test the boundaries of law and his own abilities by going into the imported alcohol trade. Predictably, Raees makes many enemies some envious rivals & some upright police officers. Jaideep Majumdar as Nawazuddin, the slightly eccentric but determined officer who takes Raees head on. 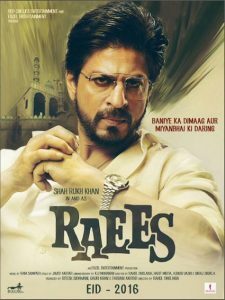 The cat and mouse race between the outlaw and the policeman make up most of the drama in Raees. The movie is a rather realistic portrayal of the brutal violence and warm benevolence that coexists in gangsters. This forms the base of a grudging respect despite the antagonism between Majumdar and Raees. Must say they shared a better chemistry than SRK & Mahira. To know if Raees makes it out of Majumdar’s clutches safely, you’ve got to watch this! Raees is SRK’s best performance in many, many years if not his career best. The controlled performance and mature acting skills King Khan displays are sure to be great contributors to the film’s success. His character as Raees is displayed with sincerity and variety of emotions. He emerges as a sympathetic and even admirable character and he does a fabulous job of portraying a brutal character albeit with soft tones in equal measure. Narrated in a linear manner, the script is to the point and the narrative moves at a rapid pace. The first half is promising and the second half which begins with Inspector Majumdar’s point of view holds your attention with equal gusto. With complex scenes, the plot offers nothing that you have not seen before. The climax tilts into a predictable zone of bad things happen to bad people, making the film a cliched fare. 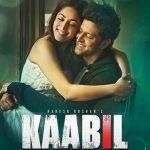 The film is largely elevated by Shah Rukh Khan’s performance and a few dramatic dialogues that are used to churn the emotions. Nawazuddin Siddique as the incorruptible IPS officer, Jaideep Majumdar is equally competent. His cat-and-mouse chase with Raees, punctuated with vibrant dialogues often elicit a chuckle. Together they keep you hooked. Nawazuddin manages to steal the show staying in par with SRK. Ram Sampath has given the music & it comes across as a very average offering in the midst of a very spiced up movie. Laila O Laila seems like the only feet tapping song. Sunny Leone delivers an item number & just doesn’t seem to get the screen on fire… wonder why? Instead felt the fight sequences was better choreographed than the dance. Lastly to end – Raees is a complete entertainment package. If you are a die-hard SRK fan, here is your chance to drool over your favourite lead man all over again after the disappointment of Fan and Dilwale. SRK’s passionate performance, Bollywood glamour, rich visuals, and full scale entertainer is your stealer. Must watch.